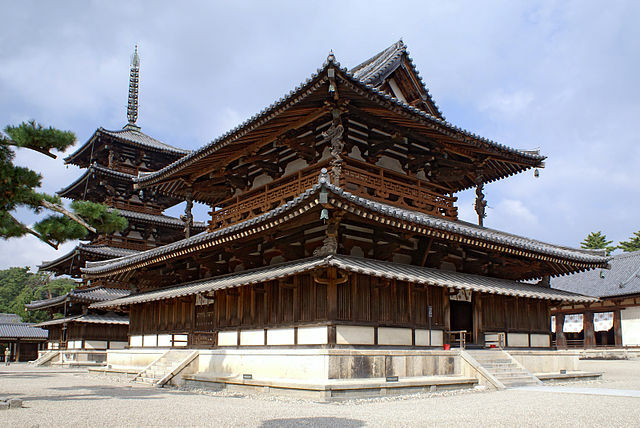 The history of the island of Honshu is basically the history of the country of Japan. It is the largest and most central of the Japanese islands and is where its current and historic capital cities are located. Before 300 BC, the early Japanese were for the most part, hunters, gatherers and fishers. 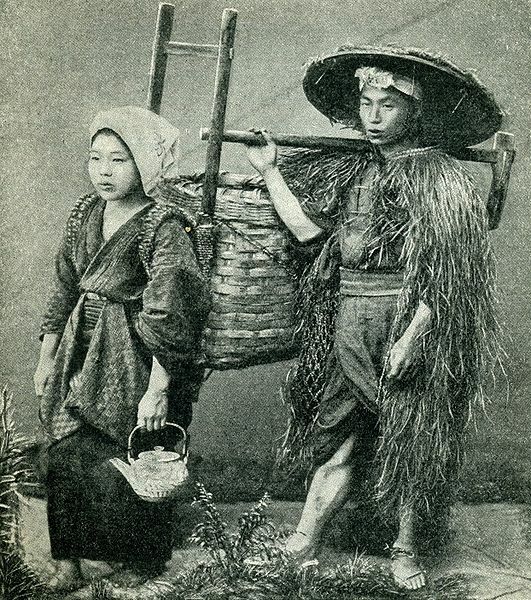 Things changed quite a bit when around that time, rice cultivation was introduced. This caused a rapid evolution in the formation of social structures. One result of this was that wealthy landowners gained positions of power. 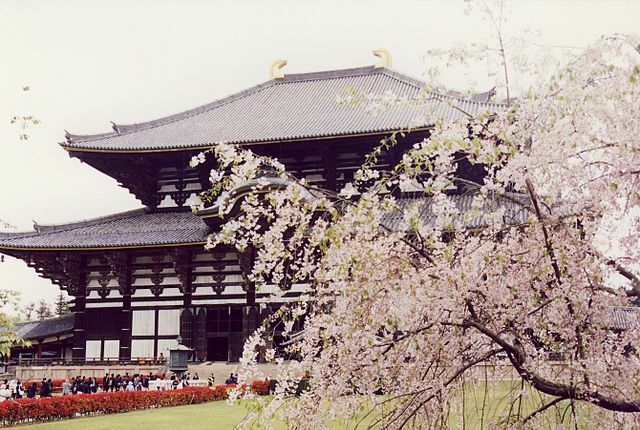 By 400AD, Japan was more or less united under a hereditary line of Emperors with the concentration of power located around present day Nara, although the capital moved frequently with the emperor from one city to another. Over the next century, the area saw a great deal of Chinese influence and Buddhism was introduced in 538AD. 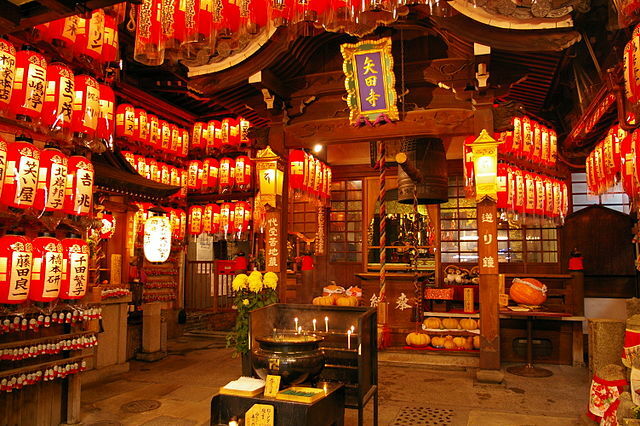 Buddhism has existed since then in Japan alongside the native religion of Shintoism. 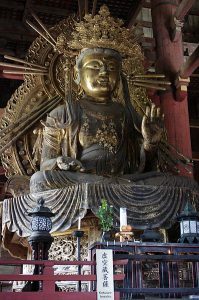 In 593, Prince Shotoku, a Buddhist, gained power and in 752 the great Buddha at Nara was completed. During much of Japan’s history, political power changed hands continuously between warring clans. 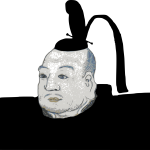 Prince Shotoku’s Soga clan was overthrown in 645 by the Fujiwara clan, who nationalized all of the land and created a taxation system. Bloody wars and power struggles followed. The second half of the 8th century also saw an abundance of natural disasters, famines and a smallpox epidemic. 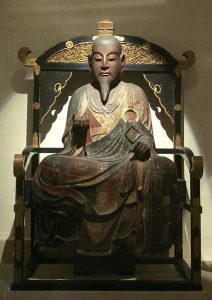 In 784, Emperor Kammu moved the capital to Kyoto. 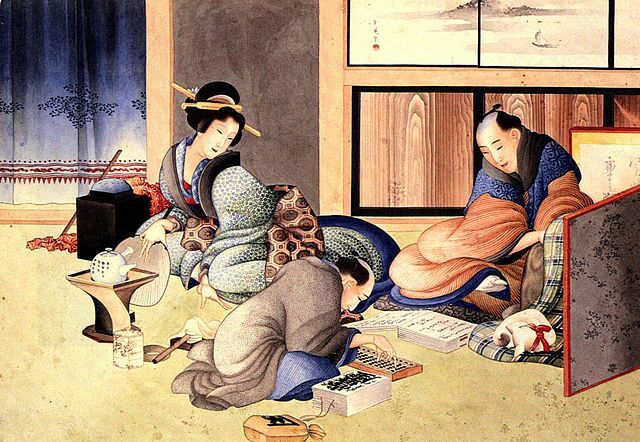 The Kyoto Period was a time when much of the great Japanese traditional art and literature was created. In the following centuries, Japan was dominated by powerful warlords called ‘Daimyo’, which translates to ‘large – private land’. 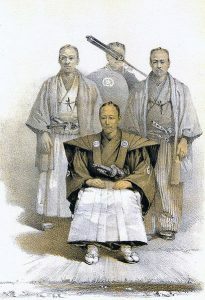 These Daimyos would hire Samurai, who were a noble class of warrior, to guard their land and protect their property. The Samurai were paid in rice by the Daimyo. 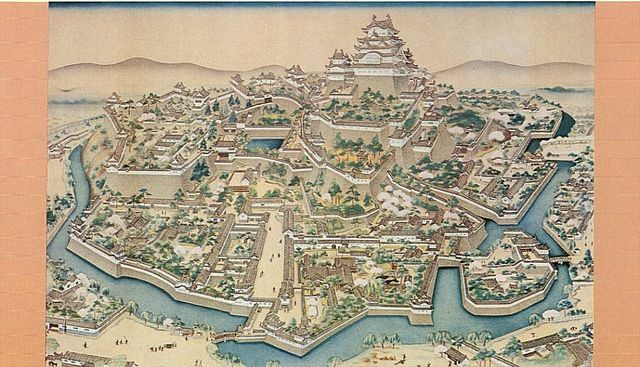 They lived in castle towns in specific Samurai residences or districts and were the only ones allowed to carry swords. 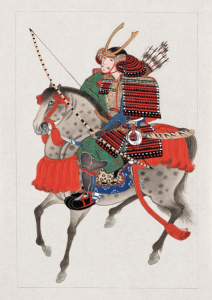 From the Daimyo arose a character known as Shōgun. The translation of the word is roughly “Commander in Chief of the Expeditionary Force Against the Barbarians”. The powerful Shōgun had the rank equivalent to a governor and their power was such that they could even give orders to the Emperor. The first Shōgun, Yoritomo, was chosen in 1192. He belonged to the Kamakura Shōgunate and ruled for only seven years. After his death, his family and followers fought one another fiercely for power. 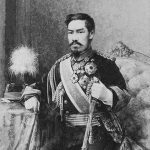 Yoritomo’s father in law, Hōjō Tokimasa was the next to claim power, but not without executing his own grandson and great-grandson along the way. 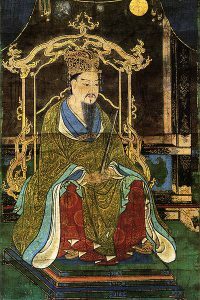 In 1274, the Mongols under Kublai Khan attempted to invade Japan, but were stopped by a typhoon. In 1333 the Kamakura Shōgunate was overthrown and the Ashikaga Shōgunate assumed power. In 1543, the Portugese arrived, introducing firearms, and shortly thereafter Christianity was first introduced to the island nation. A merchant making up the account. 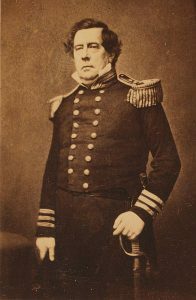 Commodore Matthew C. Perry between 1854 and 1858, Library of Congress. The year 1592 saw the beginning of the Edo Shōgunate. The Edo Period was one of the most prosperous and peaceful eras in medieval Japan. 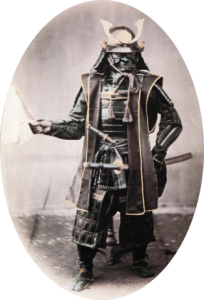 During this period, however, a strict caste system was created which placed the Samurai at the highest level of society, followed by farmers, artisans and, at the lowest level, merchants. In 1614, Christianity was banned. Beginning in 1635, Japan began a period of over 200 years of isolation. This policy – sakoku, or ‘closed country’, was implemented as an official policy by the Tokugawa Shōgunate and forbade foreigners to enter the country or the Japanese to leave. During this period, Mt. Fuji erupted. Many people died as a result of the volcanic ash and material spewed from the volcano which damaged buildings and destroyed crops. The air was so dark after the eruption that citizens of Tokyo would need to light candles during the day. The year 1854 marked the end of isolationism. Commodore Matthew Perry of the United States Navy was known as the ‘man who unlocked Japan’. Despite warnings and resistance from the Japanese, Perry made two trips to Japan. On the first visit, he was able to coax the Japanese to accept a letter and promised to return in a year. The second visit resulted in a month of negotiations and the signing of a document – the Convention of Kanagawa, which resulted in the opening of trade with the USA. The end of the Shōgunate era soon followed. Japan became a unified state under Emperor Meiji in 1868, who moved the capital from Kyoto to Edo, which he renamed Tokyo. In an effort to implement westernization, he abolished the caste system, lifted the ban on Christianity and implemented tax reform. Japan soon became a world power and its policy of isolationism changed to a policy of expansionism and imperialism. Japan went to war with China and then Russia. Both Taiwan (Formosa at the time) and Korea were annexed by Japan. A transformation to an industrial economy led to rapid growth, Tokyo became a huge city, and western style culture and dress was increasingly adopted by the population. The first half of the 20th Century brought many major events to Japan, some of them catastropic. In 1914, Japan sided with the allies against Germany in World War I. 1923 was the year of the great Kanto earthquake which destroyed Tokyo and Yokohama to a large extent. In 1926, Emperor Hirihoto invaded Manchuria and the Chinese cities of Beijing and Shanghai were captured. In 1939, World War II started. Two years into the war, Japan, influenced by a growing anti-westernization sentiment, entered into an alliance with Germany and Italy. In 1945, Japan attacked Pearl Harbor, following sanctions and failed diplomacy attempts by the USA. The end result was the dropping of atomic bombs on Hiroshima and Nagasaki, surrender, and occupation by the USA. In 1947, a new constitution was drafted for Japan by the United States, which contained a ‘no war’ clause. The USA helped to rebuild the country and in 1952, the occupation ended and Japan’s independence was declared. By 1964, Japan hosted the Summer Olympics and by 1968, it was the world’s second largest economic power. In 2011, Japan was struck by a 9.0 magnitude earthquake, which caused a tsunami and also damaged a nuclear plant causing radiation leaks. This was the strongest earthquake on record in a land that has been vulnerable to earthquakes and other natural disasters throughout its history. It is also the fourth most powerful earthquake in the world since 1900 when the record keeping began. In spite of, and perhaps because of its turbulent history, Japan has emerged as one of the world’s most fascinating cultures and destinations.